Often you do not need an advanced text processor but a virtual scrapbook to quickly write down an occasional thought, a plan for the day or an Internet URL. With a plain text editor, which can be used for this purpose, you have to run the program first, then create a new file, then type a line or two and save the file. Too many things to do in order to simply write down a thought? With Quicknote, it does not matter which programs you are currently using; whenever you want to write something down that comes to mind, just 'wake up' Quicknote by touching a small line on the top of your screen with the mouse or by pressing shortcut keys. In its resizable window you can jot down your notes and organize them in categories or even sketch small drawings. Still, this tiny tool has more possibilities than it seems on the first thought! Beneath the normal text functions, it can convert units, let you directly access frequently run programs, encrypt secret texts, change the system volume by hotkeys, manage windows tasks, and even send notes or files through a network. It has also a powerful reminding tool, which can remind you of your notes at certain times, run programs or shutdown automatically your PC. The program is absolutely free, so download this handy tool today and concentrate on content rather than form. 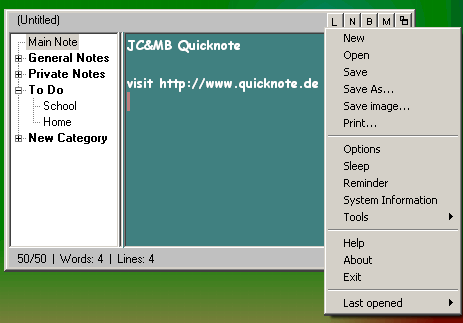 Quicknote runs with Windows 95/98/ME/NT4/2000/XP/2003/Vista/7/8/10, 32 and 64bit and is available in English, German, French, Spanish, Dutch, Swedish, Romanian and Polish. Through the Wake-Up line Quicknote is always accessible when in sleep mode. If you want to be informed whenever there is a new version, please subscribe to the Quicknote Newsletter. , Chip, Tucows, Freeware.de, Prosoftix, 3d2f.com, soft-ware.net, Download Tipp, Fiberdownload, Eurodownload.com, Pcwelt.de, Soft32, Freedownloadscenter.com, Download3000, 3d2f, Freewarehome, Filecart.com, PC-Special, Freewareweb, Freewaredownloads, Winxpfix, Vollversion.de, Freeware Archiv, Terra.es, Freesoftware.nl, iPompe, Rol.ru, Logithèque, Das Download Archiv, Computerbild, c't, T-Online, Giga.de, Snapfiles, Simtel, Softoxi, Top-Shareware.net, ZDNet.